What it is: [Apple Store Description] Get the incredibly addicting word game that everyone is talking about! Starts off easy but gets challenging fast. Can you beat the game? This modern game combines the best of word searching and crosswords for tremendous brain challenging fun! What I love: This game has seemingly endless levels that allow you to manipulate, blend, and analyze sounds and letters to make as many words as you can find. Each level has a wheel of letters and the goal is to complete the puzzle. Every puzzle has at least one word that uses every letter provided (as few as 6, as many as 8) and you can use existing words to help uncover the words you haven’t found yet. There is also a daily puzzle that requires you to guess the words in a particular order, so that you can capture the butterflies, win coins, and be able to use hints and other extras in the game–these daily puzzles have added difficulty, since you have to use strategy and work within the area of the puzzle they want you to solve. I also love that they will provide you with the definition of a word that is unfamiliar. I have played over 700 levels of this game and still find it interesting and challenging! Another bonus is that the levels are very beautiful. The backgrounds change frequently and they are always visually appealing! 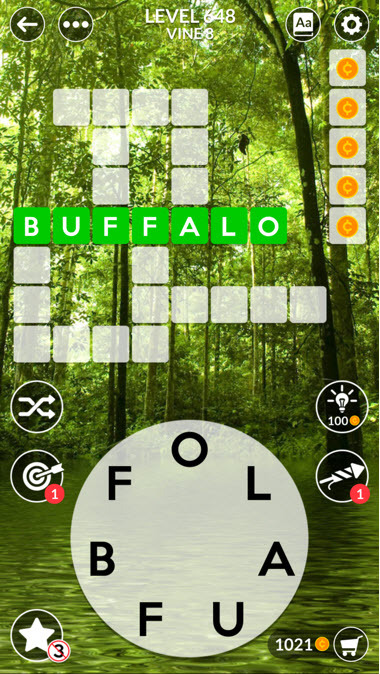 If you are a wordsmith, this game is for you! What I’d change: The ads are annoying. You can buy an ad-free version of the game for a small fee! It’s hard to accumulate the extras that are sometimes helpful to finish a level (although you can also purchase these for a few dollars), and the puzzles can sometimes seem redundant.